Offshore, underwater nuclear power stations would be manufactured in dry dock just as ships, submarines and many current offshore platforms. Dry dock construction improves quality, consistency and efficiency by concentrating all the most advanced equipment, techniques and expertise at one point of construction for all offshore, underwater nuclear power stations. 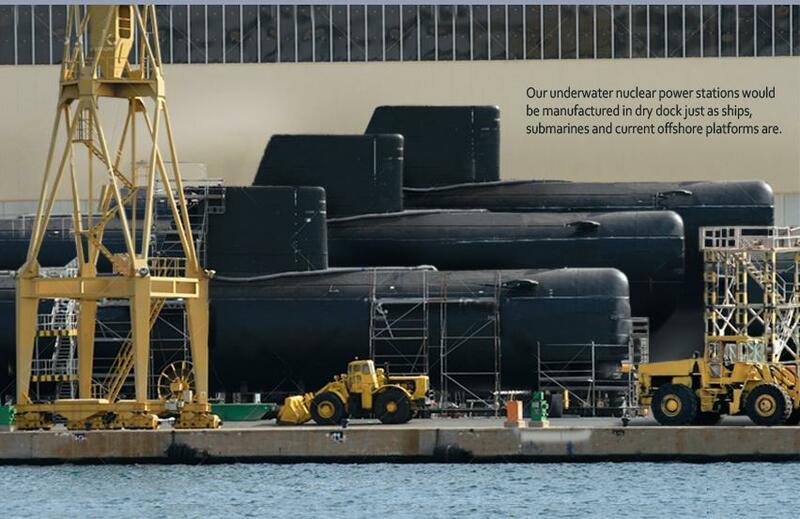 Dry dock manufacture also parallels the U.S. Navy's current construction system for nuclear powered submarines and aircraft carriers, streamlining the application of naval nuclear technology to offshore power generation. Many of the same contractors currently working on naval or offshore platform construction would no doubt be involved, drawing on a wealth of experience and know-how based on real world problem-solving under some of the most challenging conditions and strictest safety requirements in the world. Centralized dry dock construction transforms nuclear plant building from a one-by-one on-site construction process to a mass-produced manufacturing operation, with all the benefits in safety, consistency and efficiency that follow. Many nuclear power experts have recommended adoption of standardized or even modular designs for nuclear power plants. Dry dock construction takes that one step further, and builds the entire plant at one location, or at any necessary number of locations specifically equipped, designed and dedicated to that purpose. This mass production process is also the only one that allows the building of the number of nuclear power stations required to both eliminate greenhouse gas emissions and transform the U.S. from a dependent energy importer to an independent, massive energy exporter. Once completed, a nuclear power station would be towed or move under its own power to its location along the continental shelf, and connected to underwater power cables through a docking station. Linked to shore-side electrical grids the station would then become active. Like submarines and other ships, the station would routinely return to port for maintenance, resupply and repairs, thus allowing the same standardized, controlled-environment benefits of manufacturing to apply to maintaining the station to maximize safe, secure and efficient standards.